Will 20 Tribal Families in Wayanad be settled with new settlement? Will Sabarimala issue be a major factor determining the way people vote this time? Will Keralites boycott Elections as hit badly by Floods? Student's answers with KGF, Baahubali references! Why no BJP candidate has filed nomination in Pathanamthitta, where Sabarimala Is Located? Anil Antony, the son of former Defence Minister AK Antony, on Tuesday said he will be managing the Wayanad-specific Twitter account of Congress President Rahul Gandhi. Anil who works as an IT professional said "Rahul Gandhi's office has started a new Twitter account RG-Wayanad. His office has given me the task of managing it till May 23”. 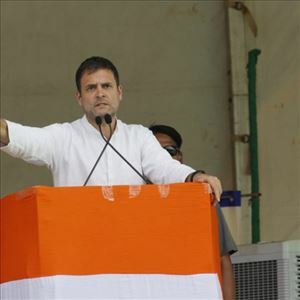 Reportedly one of the most discussed aspects regarding the Lok Sabha elections in Kerala was the arrival of Rahul Gandhi as the United Democratic Front’s (UDF) candidate from the Wayanad constituency, which led to talks about a “Rahul wave” in the state. But a survey conducted by Asianet News, along with AZ research, feels otherwise. Thiruvananthapuram sources stated that with only a few months remaining for monsoon to hit the Kerala coast, residents of the coastal village of Chellanam in Ernakulam district have intensified protests demanding completion of a seawall to prevent sea erosion. Meanwhile the residents of the Chellanam sat on a dharna outside the office of the Superintending Engineer at the Irrigation Central Circle in Thrissur. Sources from Thiruvananthapuram stated that Benny Varghese, 49, and his wife Alice, 43, have been living in an asbestos roofed, dimly lit, poorly ventilated room in an old building in Kerala's Idukki district since they escaped a landslide brought on by last August's massive floods and the disaster wrecked their quarter hectare farm. BJP released the first list of candidates for the upcoming Lok Sabha elections in Kerala. Out of 14 candidates, BJP revealed 13 candidate names and one notable absence was for the candidate seat of Pathanamthitta, the district where the Sabarimala temple is located. Accordingly the Bharatiya Janata Party (BJP) had finally announced their candidates from Kerala for the 2019 Lok Sabha elections. Meanwhile the party has announced candidates for 13 out of the 20 Lok Sabha seats in Kerala and the candidate for Pathanamthitta, a seat that almost three leaders are vying for, has been left unannounced. Accordingly Thrissur native and founder of LuLu group, MA Yusuff Ali, is now the richest Malayali in the world, according to the Forbes Billionaires list for 2019. Meanwhile with an estimated personal wealth of 4.8 billion dollars, Yusuff Ali, also known as the 'Retail King of the Middle East' ranks 394 in the list of the worlds richest. Reportedly Yusuff was the 26th wealthiest Indian in the world in 2018. Accordingly Vizhinjam Port, one of Kerala's dream projects that have been hanging fire for over 25 years, will be commissioned in October 2020. Meanwhile when addressing reporters in Thiruvananthapuram on Thursday, Rajesh Jha, CEO, Adani Vizhinjam Port Pvt Ltd, said that even though the original agreement was to complete the work and commission the port in 1,425 days, due to some issues it has been postponed to October 2020. According to sources a housewarming ceremony with family and friends, but for this family in Kottapadi in Guruvayur temple town of Kerala, the occasion turned out to be tragic. Meanwhile a 54 year old elephant that was in the vicinity trampled two of the guests to death, and injured 7 others. Accordingly Budget airline GoAir on Tuesday said that it will commence direct flight operations on Kannur-Abu Dhabi-Kannur route from March 2019. Reports added Abu Dhabi will become the airline's fourth international destination and 28th overall. The company said in a statement "GoAir will operate 4 direct flight services per week between Kannur-Abu Dhabi-Kannur and bookings are now open at an all inclusive one way fare starting from Rs 6,099". Accordingly the Supreme Court has on Wednesday adjourned the hearing of the plea filed by actor Dileep to obtain a physical copy of the video visual recording of the sexual assault of the popular actor who was assaulted in February 2017. When citing a petition filed by Dileep’s lawyer, Mukul Rohatgi, the Supreme Court adjourned the hearing of the case, and specified that the case should be listed in four weeks. According to sources one of the two women, who became the first in menstruating age to offer prayers in Kerala’s Sabarimala temple, was sent to a government run home on Tuesday after her in-laws refused to let her enter in their house. Meanwhile Kanaka Durga, a mother of two, had angered her family after they said she kept them in the dark about her plan to trek to the temple. The Bollywood babe Kiara Advani did not have a dream start to her career, as despite being launched by Salman Khan himself in Fugly, she did not taste early success and it was her performance as Sakshi Dhoni in MS Dhoni the Untold story that won her recognition. Tirumala Tirupati Devasthanams (TTD) is an independent trust which manages the Tirumala Venkateswara Temple at Tirumala, Andhra Pradesh. It is the World's richest Hindu Temple. Now, it has been revealed that a sum of Rs.507 Crores has been deposited in the TTD's fund for the financial year 2018-19. CBN and his 25 seat request! Andhra Pradesh Chief Minister and Telugu Desam Party president Nara Chandrababu Naidu in an unexpected manner had predicted the ill fated of his party in the upcoming State elections which are scheduled to be held on April 11. Chandrababu Naidu was in an election meeting, and during his speech had appealed to the people to make sure his ruling TDP gets at least 25 assembly seats. Sindhura Goud from Hyderabad lost his father just because of the inhuman nature of an Ola cab driver and his negligence. The cab driver had been requested by Goud due to an emergency situation for his father but the Ola driver did not accept to take the ride and take his father inside the car saying it was unhygienic. Will KCR come to secretariat on regular basis? Accordingly in his last term Telangana CM KCR visited secretariat hardly few times. Earlier the oppositions have heavily criticized KCR on this and questioned why the CM is not bothered coming to secretariat. Despite the opposition’s criticism, KCR continued to do his day to day operations from Pragathi Bhavan and few bureaucrats call Pragathi Bhavan as mini secretariat for obvious reasons. Hyderabad sources reported that TRS Working President KTR has come down heavily on Chandrababu Naidu and his "EVM politics". When lashing out at Naidu and his angst on EVMs, KTR found fault with the seasoned politician. Furthermore KTR asked Naidu to accept people's mandate which will be out on 23rd May and asked him to stop "street dramas" (Veedhi Natakalu). The dates for Lok Sabha Polls are revealed and all the parties are busy with campaigning and degrading the rivals. We can see social media trending with hashtags #GoBackModi, #GoBackRahul and so on. With the heat is already on, the predictions also begin. All eyes are on India's Lok Sabha Elections and the Election Commission of India (ECI) has announced the final dates a few minutes back. The elections will be conducted in seven phases in April-May and the counting will be done on May 23, 2019. A Shout-Out to all the Crowd-Funders and Investors from IBF Labs!! India was more concerned about the threats it faces in the space and the Pentagon has defended India's ASAT missile test. For those who couldn't recall, On March 27th, India achieved a historic feat by shooting down a low-orbit satellite with a ground-to-space missile. Why Jet Airways March Month salary delayed? India's GDP under Modi and Manmohan! National Statistical Commission (NSC) released its draft report on growth under Dr Manmohan Singh and Narendra Modi. Narendra Modi government revised base year of national income estimates from 2004-05 to 2011-12 and replaced it with Gross Value Added (GVA). Government also increased coverage of agricultural, financial sectors.